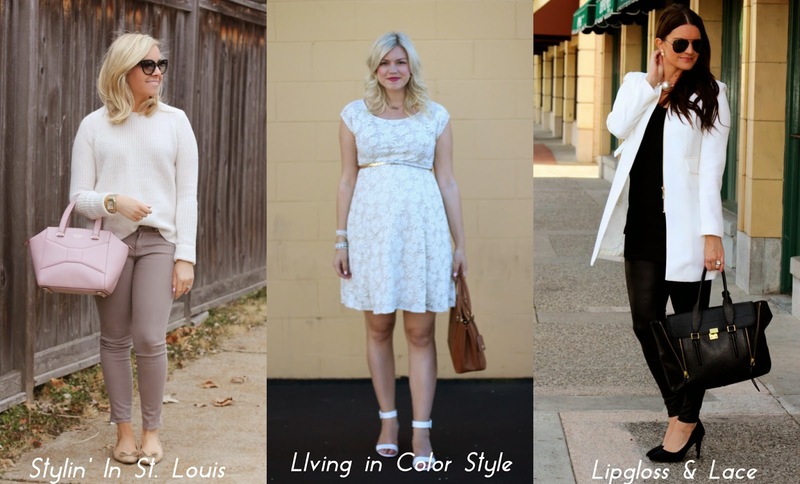 Stylin in St. Louis: Spotlight of the Week: Winter White…. Spotlight of the Week: Winter White…. Happy Thursday! This week has flown by! After having Monday off, I cannot believe it is already almost Friday! Did you catch the earrings and bracelet that I am wearing? Emma joy wants to offer you a discount! Use code STLOUIS20 for 20% off your entire purchase! 1. We kindly ask that you follow the two hosts: Elle from Living in Color Style and Jacqueline from Stylin' In St. Louis via Bloglovin or GFC and of course our co-host Shauna of Lipgloss and Lace . Spotlight: Our spotlight this week is Johanna of 101 Things I love! We just love this red and pink look that Johanna put together! It is so classy and just perfect for Valentine's day! Be sure to check out her blog! Next week: Next week our spotlight weekly theme is THINK SPRING! Thanks for linking up! See you next week! Love all the neutral colors, very pretty. I'm loving the soft neutrals and your gorgeous pink bag! You can't beat a pretty + cozy winter white sweater like yours! Loving the look, babe! I just linked this same sweater. Love it! You look so pretty in this soft winter white look! Your makeup and accessories are always perfect! Loving a winter white cozy sweater! It looks great with the gray and pink! Love your Winter White Sweater and your earrings are fab, Jac! I love the soft shades in your outfit. That bag is the perfect touch to it! I just love your outfit! Love the color of your pants and that bow purse has always been a favorite of mine. Loving your winter white look! The mix of pastels and white is terrific!! I'm loving all the neutrals paired with the winter white! Perfect neutral combo and that pop of pastel was the cherry on top of it all. Really pretty! I'm the biggest fan of winter white, and as you might imagine, a huge fan of your color palette here! Great neutral look, you look pretty! Loving the pink handbag! I adore winter whites and this pretty pastel look is no exception. That bag is gorgeous! Love winter whites, great look. I have an outfit I styled just like it :) and that bag is so cute! I LOVE all these neutrals together! The pale pink bag is too cute! Beautiful! I love your clean, super chic look! Those striped pants are outstanding!